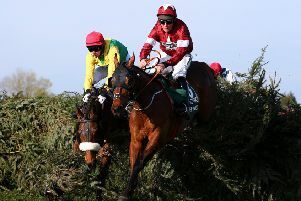 Several leading entries in this year’s Crabbie’s Grand National are in contention to take their place in the BetBright Grimthorpe Chase at Doncaster on Saturday. Twenty names featured at the five-day declaration stage for the three-and-a-quarter-mile handicap, which was won 12 months ago by subsequent Scottish National winner Wayward Prince. The Druids Nephew, who is a general 20-1 chance for the Aintree marathon, is one of two horses alongside Whats Left entered by trainer Neil Mulholland. The Last Samuri, another with Grand National aspirations, is the representative of Kim Bailey, who was responsible for 1994 winner Shraden Leader. Last year’s runner-up Drop Out Joe from the yard of Charlie Longsdon features together with stablemate Coologue, while Wonderful Charm and Just A Par are in contention to fly the flag for champion trainer Paul Nicholls. Sego Success, a five-length winner on his previous visit to the South Yorkshire track, has been left in by trainer Alan King, with former Scottish Grand National winner Al Co in line to make an appearance for Peter Bowen. Venetia Williams has two options in the form of Renard and Aachen, and 2012 winner Ikorodu Road, now in the care of Graeme McPherson, has also been given an entry. The list is completed by Band Of Blood (Dr Richard Newland), Bear’s Affair (Nicky Henderson), Masters Hill (Colin Tizzard), Presenting Junior (Martin Todhunter), Seebright (Victor Dartnall), Seventh Sky (Charlie Mann), Valleyofmilan (Donald McCain) and Yes Tom (Stuart Crawford).